I do not use my Sony Erisccon Xperia X1 much these days, as it is my UK handset, so it is not unusual for it to complain about low battery power whenever it is switched on. However rather than the usual pulsating charge lights that I am used to seeing, the power button was glowing red. The phone was also clearly not charging as waiting a while then trying to switch on the phone was not having the usual vibration followed by boot-up, and trying different USB chargers did not help. Not exactly the thing I wanted the evening before a flight to the UK. 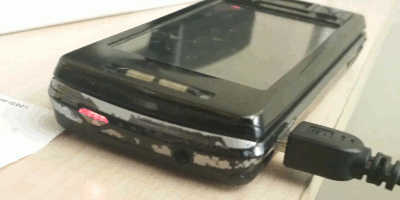 If the phone was plugged in with no battery the red power button LED (shown below) was lit continuously, whereas if there is a battery it alternated between being lit for around 4 minutes then unlit for a similar amount of time. Pressing the power button during an 'off' period caused the light above the USB socket to blink three times in quick succession. This did at least fill me with confidence that it was a power issue and not dead circuitry. Also of note was the battery remaining cold, which is unusual as it usually gets surprisingly hot. The best forum thread I could find on the matter very much pointed towards it being a dead battery, which does not surprise me given how much it had been switched off. The Xperia X1 reportedly has slightly flaky power management, and in particular has difficulty with completely flat batteries. Although about a year ago I had problems with the phone display not working after being kept in a humid environment, the problem there was the screen not working properly (or at all) rather than the phone not booting. That had all long cleared up, and since then have tended to keep the phone in a sealed container with a pouch of silica gel, so it was definitely not a moisture issue. The phone had also taken some hard knocks in the distant past, but I doubted physical damage was an issue either. The whole Xperia range seems to use a standardised battery (model BST-41), and although I ordered a new one off EBay, I decided to also order a charger, and the latter happened to arrive much more quickly. I charged my existing battery in it for an hour or two, and afterwards the phone came back to life. At time of writing my replacement battery has not arrived, and given its cost (only a few pounds) it is possible it might turn out to be one of the fakes I have read about. In any case, my phone is now alive, and that is the main thing that mattered. It seems that the Xperia X1 charging circuitry isn't capable of doing a cold-start recharge of a fully depleted battery, and it is also unable to run on USB power alone. Only thing I am uncertain about is whether this is due to cumulative damage & wear-and-tear, or whether it is designed behaviour.